The resulting eigenmodes can be compared to and validated against the analytical solution for the resonance frequencies of a boxed enclosure, that is f = c/2*√( (i/lx)2 + (j/ly)2 + (k/lz)2 ) where i, j, and k are integer permutations 0 ... n for the various modes. This model is available as an automated tutorial by selecting Model Examples and Tutorials... > Classic PDE > Resonance Frequencies of a Room from the File menu. Or alternatively, follow the step-by-step instructions below. Both the Poisson Equation and Custom Equation physics modes are suitable for this model example but in the following tutorial the Custom Equation will be used. Select the Custom Equation physics mode from the Select Physics drop-down menu. Enter p into the Dependent Variable Names edit field. Press the Create cube/block Toolbar button. Enter 4 into the xmax edit field. Enter 3 into the ymax edit field. Enter 2.6 into the zmax edit field. Enter 0.5 into the Grid Size edit field. For this eigenmode analysis the right hand side of the Helmholz equation is not involved and is therefore set to zero. Enter p' - (px_x + py_y + pz_z) = 0 into the Equation for p edit field. Homogenous Neumann boundary conditions are used for all boundaries to represent solid and impermeable walls. Select all boundaries (1-6) in the list box. Select the Neumann, g_p radio button. 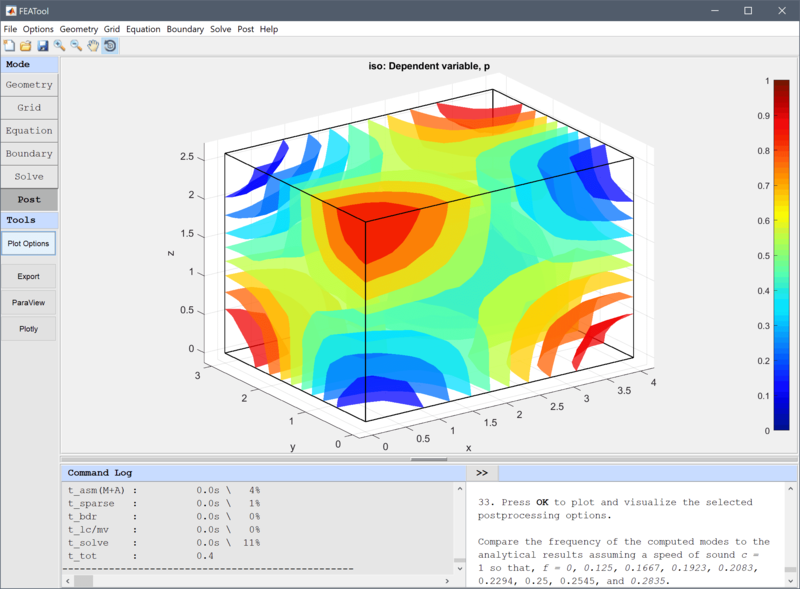 Open the Postprocessing settings dialog box, plot and visualize some eigenmodes to compare them. One can see how the lower modes resonate in a single direction, and increase in complexity and frequency as the number of resonance modes are added. Clear the Surface Plot check box. Select the Iso Plot check box. Press Apply to plot and visualize the selected postprocessing options. Select 0.611429 (0.124449 Hz) from the Available solutions/eigenvalues (frequencies) drop-down menu. Select 1.07499 (0.165015 Hz) from the Available solutions/eigenvalues (frequencies) drop-down menu. Compare the frequency of the computed modes to the analytical results assuming a speed of sound c = 1 so that, f = 0, 0.125, 0.1667, 0.1923, 0.2083, 0.2294, 0.25, 0.2545, and 0.2835. The resonance frequencies of a room classic pde model has now been completed and can be saved as a binary (.fea) model file, or exported as a programmable MATLAB m-script text file, or GUI script (.fes) file.